Yet another Firefox feature you won’t find in Chrome. Open the image or video’s specific Instagram page (e.g. https://www.instagram.com/p/BOpZDePDQ2b/) in Firefox. In the window that pops up, click the Media tab. Sort the results by Type. Select which one you want. And that’ll do it. You’ll get the original .jpg upload or an .mp4 video. This method of downloading videos also works for Clippit.tv, with the exception that you might have to play the video first to allow Firefox to sniff it before clicking Page Info. Of course you need a PC to work around a subpar mobile app. If you don’t have it already, download and install desktop Firefox (I prefer the Nightly builds). Open the My Mixtapez page corresponding to the song you want download. e.g. https://mxtpz.me/a/108717. Start playing the song you want. Right-click the page background to bring up Firefox’s context menu. Sort the results displayed by Type so that Audio is at the top. Click Save As… and download the file. Repeat Steps 3 to 9 for every song you want on the page from Step 2. Navigate to the location you downloaded the file to in Step 9. Click the File Explorer View tab. In the Show/hide group, check the File name extensions box. Now that the file name extensions are visible, change them to .mp3 for all the files you downloaded in Steps 9 and 10 via renaming. The files in Step 15 will all be the original, playable mp3 files. The Page Info feature is one of the main reasons Firefox continues to by my main browser; it’s basically a built-in content sniffer. Whether accidentally or by design, Twitter obfuscates image URLs in desktop browsers. Twitter’s recent allowance of multiple uploaded pictures per tweet has been great for tweeters, but not so great for desktop users who want to download said images. * Right-clicking on a pic no longer gives you the option to save it or view its URL, and even the copy function captures only a white background. Install the DownThemAll 3.0b5 add-on. In the windows that pops up, click the Pictures and Media tab. You can either right-click each URL, click Copy Link, and then navigate to and download the pic as usual; or you can select those files only, select a download path in the Save files in: field, and click Start. If you select the latter option, the downloaded files will be located at that path you selected. I don’t know of any way to do the above with any other browser (Microsoft Internet Explorer, Google Chrome, Apple Safari, or Opera), but if you do let me know in the comments and I’ll add the method here. *Ironically, mobile app users can save pics quite easily. **One of the reasons I use Firefox (Nightly Win64) as my main browser is it’s absolutely the best for power user stuff like this. A long, long time ago (c. 2005), in a galaxy far, far away, there was a download client called AutoXDCC. 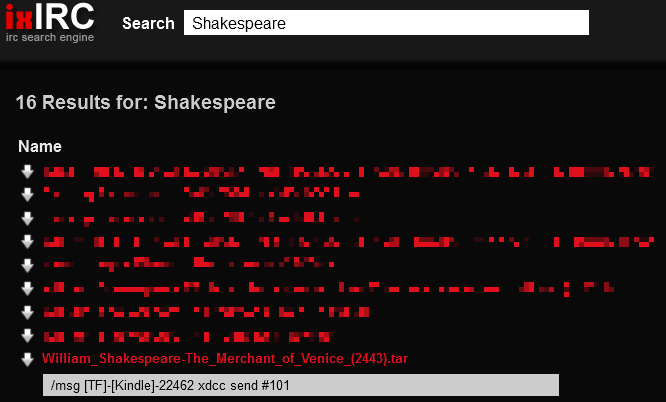 AutoXDCC allowed you to automatically download from IRC using XDCC files links in the same manner that a BitTorrent client allows you to download files from BitTorrent swarms using torrent files or magnet links. Sadly, AutoXDCC no longer exists, and there hasn’t been any replacement in terms of ease of use since. Fortunately, you can still download using a regular IRC client and, unlike in AutoXDCC’s heyday, there are pretty good free and open source client options. * Back in 2005 your IRC client options were pretty much mIRC or nothing. Download and install HexChat. Choose the x64 build if you’re on a 64-bit OS. Set up HexChat. The only thing you’ll need to do is select your desired username on servers you connect to. You can also disable taskbar icon blinking in response to every message via Settings -> Preferences -> Chatting -> Alerts and unchecking all Blink task bar on: boxes as below. 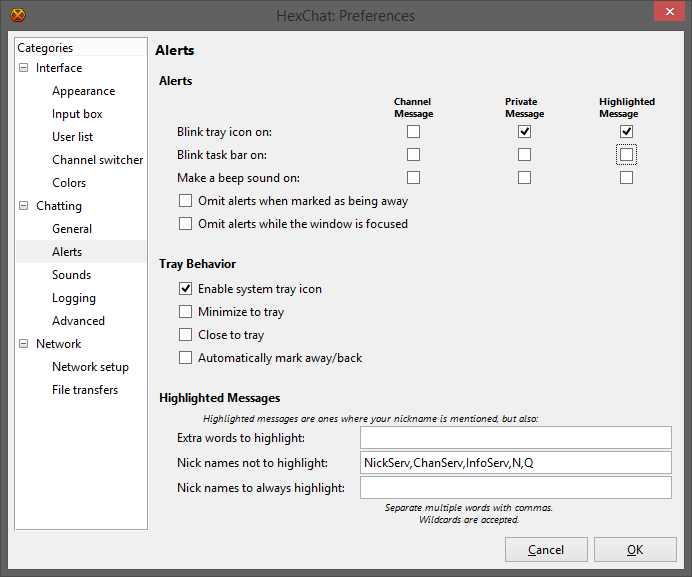 How to stop HexChat from going nuts in your taskbar. 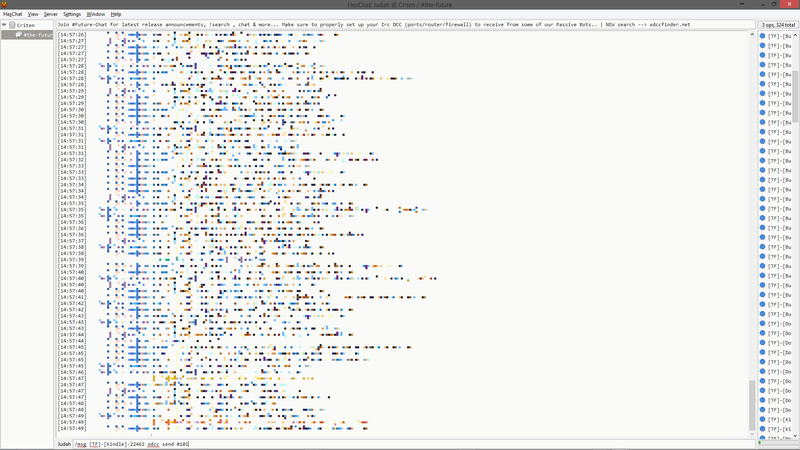 Visit an IRC indexing site. The best one I know of is ixIRC. Search for what you want at the above site. In the search results, click the downward pointing arrow to the left of the desired result. This will expose the command you need for the next step and cause Windows to prompt you for an IRC client to pass the IRC link to. You may have to manually browse to and select the HexChat executable – located at C:\Program Files\HexChat\hexchat.exe for the 64-bit build – from the Choose an Application menu. Once the link is passed, HexChat will open and connect to the corresponding IRC server and channel automatically. You’ll want to copy the obscure command below the desired result. Copy the command exposed in Step 5 to the compose field of HexChat as shown below. Paste the command into the HexChat’s compose field and hit Enter. Assuming HexChat can find the file you just requested, the HexChat: Uploads and Downloads window will open. When it’s your client’s turn to download the file (download requests are queued at the source) a file save dialog will open. Select your desired location and click Open, then wait for the download to complete. And that’s all there is to it. Hopefully this guide is easier to understand than the obscure ones I found via Google search. *A paradoxical effect of enforcement on conventional P2P, Usenet, and direct download sites as well as the rise of Anonymous and similar groups has been a muted resurgence of IRC.